We then determine the best fitting lens based on your lifestyle needs and the shape and health of your eye. In most cases, you’ll have the opportunity to try lenses on the same day as your exam. You can even return home with a few samples before making a final decision. We follow-up the initial fitting and then make any necessary changes in fit or materials to get you the best possible fit. We teach all our patients proper contact lens care and also possible consequences if proper care is not taken. Then we continue with long-term follow-up to monitor the condition of the lenses and to ensure that proper hygiene is being maintained. A routine exam cannot provide some of the measurements and testing that are required to determine if your eyes are suitable for contact lens wear, and to generate your contact lens prescription. Bifocal and Multifocal Contact Lenses: If you need correction for presbyopia but dislike the idea of bifocal eyeglasses, you have many contact lens options. Gas Permeable (GP) Contact Lenses: These rigid lenses are not as popular or well-known as soft lenses, but they offer the advantages of durability, crisp vision, and high oxygen permeability. Contact Lenses for the “Hard-to-Fit” Patient: Challenges such as astigmatism, presbyopia, keratoconus, and dry eyes needn’t be a barrier to contact lens wear, but they do require more time and patience. Toric Contact Lenses for Astigmatism: “I can’t wear soft contacts; I have astigmatism.” This once-true statement is now simply a myth. Air Optix Colors: Ever wish you had different color eyes? Now you can! The first step in a contact lens fitting is a consideration of your lifestyle and your preferences regarding contact lenses, such as whether you might want to change your eye color with color contact lenses or if you’re interested in options such as daily disposables or overnight wear. Although most people choose soft contact lenses, the advantages and disadvantages of rigid gas permeable (GP) lenses will likely be discussed as well. An instrument called a keratometer is used to measure the curvature of your eye’s clear front surface (cornea). This measurement helps your doctor select the best curve and diameter for your contact lenses. If your eye’s surface is found to be somewhat irregular because of astigmatism, you may require a special lens design of lens known as a “toric” contact lens. At one time, only gas permeable contact lenses could correct for astigmatism. But there are now many brands of soft toric lenses, which are available in disposable, multifocal, extended wear, and colored versions. The size of your pupil and iris (the colored part of your eye) can play an important role in determining the best contact lens design, especially if you are interested in GP contact lenses. These measurements may be taken with a lighted instrument called a biomicroscope (also called a slit lamp) or simply with a hand-held ruler or template card. 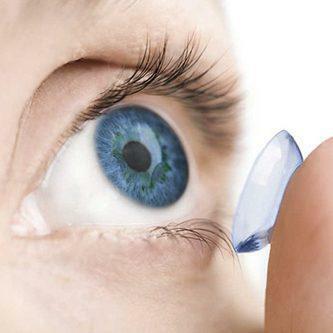 To be successful wearing contact lenses, you must have an adequate tear film to keep the lenses and your cornea sufficiently moist and hydrated. This test may be performed with a liquid dye placed on your eye so your tears can be seen with a slit lamp, or with a small paper strip placed under your lower lid to see how well your tears moisten the paper. If you have dry eyes, contact lenses may not be right for you. Also, the amount of tears you produce may determine which contact lens material will work best for you. You will typically need to wear these trial lenses for at least fifteen minutes so that any initial excess tearing of the eye stops and your tear film stabilizes. If everything succeeds, you will be given instructions on how to care for your lenses and how long to wear them. You will also receive training on how to handle, apply and remove the lenses. Often, your doctor will be able to see warning signs develop before you are aware a problem with your contact lens. If such warning signs are evident in your follow-up visits, a number of solutions may be recommended, including trying a different lens or lens material, using a different lens care method, or adjusting your contact lens wearing time. In occasional cases, it may be necessary to discontinue contact lens wear altogether. Regardless of how often or how long you wear your contact lenses, your eyes should be examined at least once a year to make sure your eyes are continuing to tolerate wearing contact lenses with no ill effects. Bifocal and multifocal contact lenses are designed to give you good vision when you reach your forties. From the age of forty onward, you may need to hold reading material—like a menu or newspaper—farther from your eyes to see it clearly. This condition is called presbyopia. These are bifocal lenses with either the distance or near power in the center of the lens, with alternating rings of distance and near powers surrounding it. These are progressive-style multifocal lenses, with many powers blended across the lens surface. Some aspheric lenses have the distance power in the center of the lens; others have the near power in the center. Alternating Vision (or Translating) Lenses. These are GP multifocal lenses that are designed like bifocal eyeglass lenses. The top part of the lens has the distance power, and the bottom part of the lens contains the closeup power. When you look straight ahead, your eye is looking through the distance part of the lens. When you look down, your lower lid holds the lens in place while your pupil moves (translates) into the near zone of the lens for reading. Most people who try multifocal contact lenses are happy with them, but some compromises may be necessary when you wear these lenses. For example, your distance vision with multifocal contact lenses may not seem clear enough, or you may have troubles with glare at night or not being able to see small print.